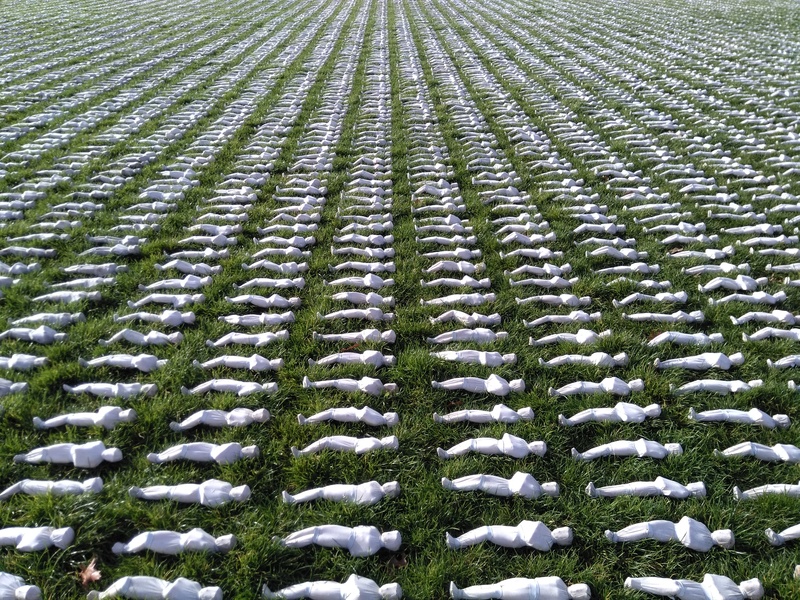 Shrouds of the Somme is an exhibition by Rob Heard at the Queen Elizabeth Olympic Park, and is a physical representation of every one of the 72,396 British Commonwealth servicemen killed at the Somme that have no known grave. I went along with my sister to have a look and to remember all those that have fallen in war. 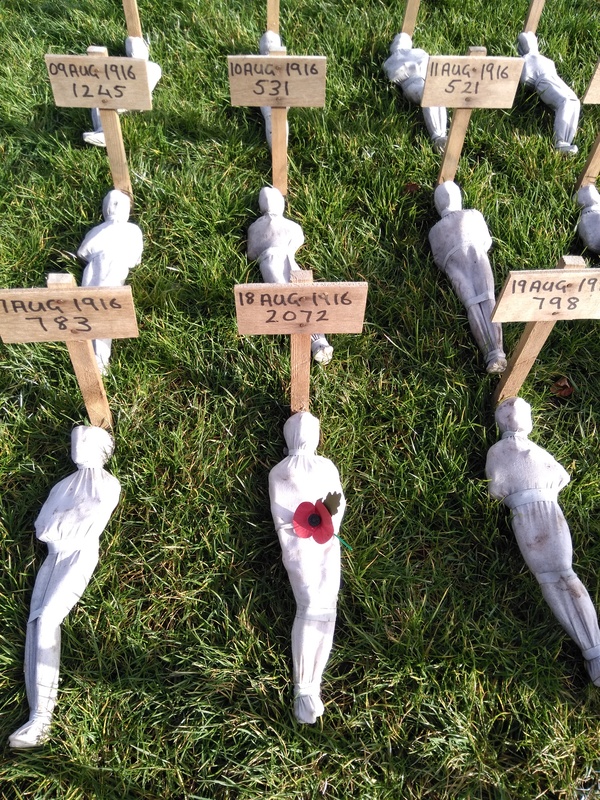 Each fallen servicemen was represented as an individual, miniature figure wrapped in a shroud. The figures were laid out in neat rows, and were slightly different to one another. 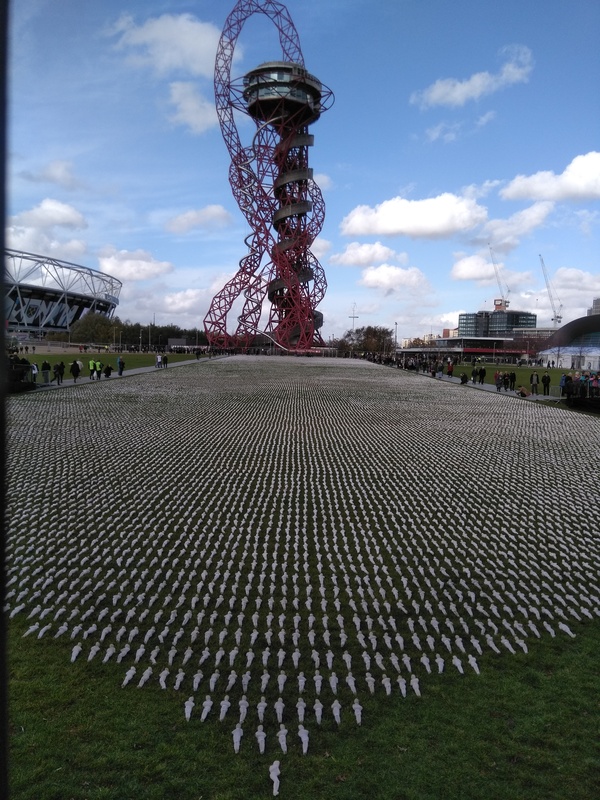 Looking at the shrouds, it was astonishing and incredibly powerful to see just how large a number 72,396 is, a number that is difficult to comprehend in your head. To one side of the field, there were a smaller number figures. These had placards at the head of each figure with a number and a date. The dates ran from the battles before the Somme in 1914 and ran to battles until 1918. There were dates for every day in those years. The numbers below the dates showed how many servicemen have died on that day. The deadliest day was at the start of the Somme, July 1st with 19,240 that died. The exhibition was a very powerful one, and quite an emotional one my sister and I found. It was difficult, poignant and important to see just how many had died for our freedom and way of life. I was pleased to see that there were lots of school children on a day trip to the see the shrouds. We have to hope that exhibitions like these have an impact on future generations and that we look for peaceful solutions to conflicts instead of violent ones that destroy families and communities. 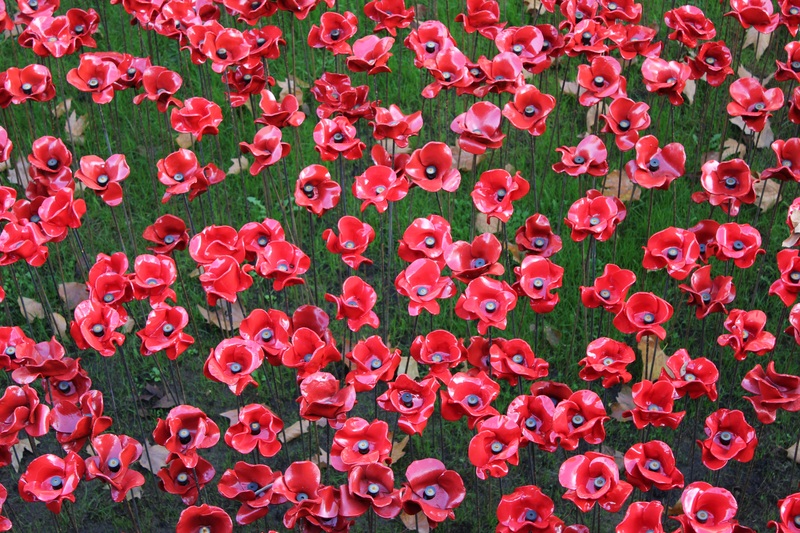 It’s Remembrance Day today, a day to remember those that died in the line of duty since World War I. 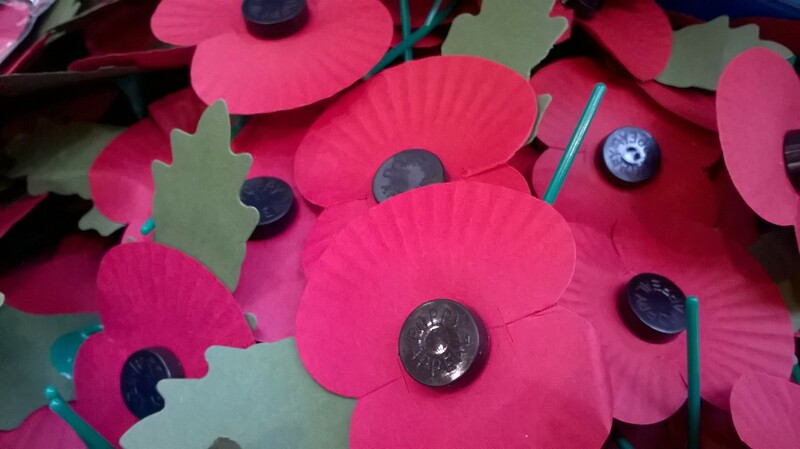 A poppy is worn on the days leading up to November 11th and at 11am today a minute’s silence will be held across the UK to think of those that fell. Poppy day or Remembrance Day as it is officially known, is marked in the UK to remember the armed forces that died in the line of duty. 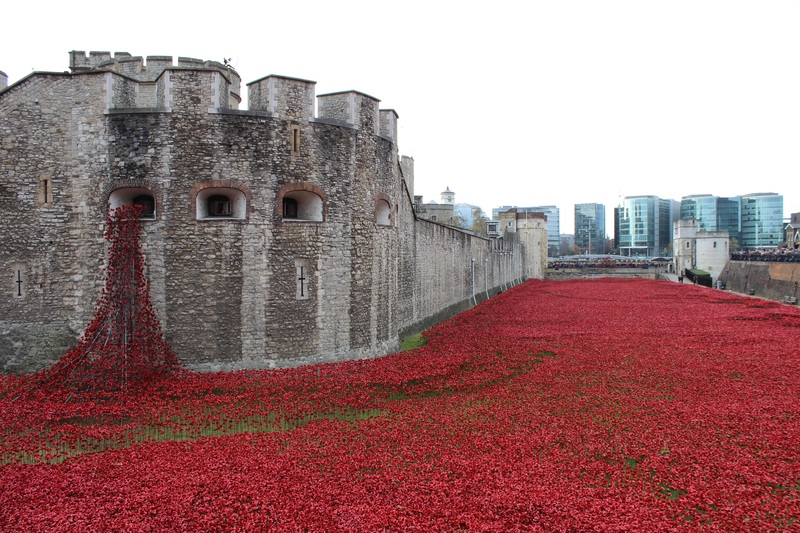 To mark one hundred years since the first full day of Britain’s involvement in the First World War the Tower of London has installed an art installation called Blood Swept Lands and Seas of Red, which is made up of 888,246 ceramic poppies encircling the Tower, each poppy representing a British military fatality during the war. The poppes have been added to the moat of the castle from August with more being added everyday. As Remembrance Day was drawing near (11th Novemeber, after which the poppies would be removed and sold) I decided to go take a look. I got to the Tower early in the morning and it was already really busy with lots of people. Luckily I was able to get a view from the angles I wanted and I got some pretty good pictures, I would have loved to be able to go down to ground level and see them but that was out of bounds to the public. I think the simple idea of using poppies was very striking when all put together, it really brought home just how so many British people had died in the war. It also made me think about all those that had died around the world in the past due to wars and are still continuing to do so. Trey Ratcliff's Travel Photography blog with daily inspiration to motivate you!